Recording with the StoryCorps App is about sitting down with a someone you care about, asking them a few important questions about their thoughts and the life they have lived, and then listening. It’s a great opportunity to learn something new about someone you think you already know so much about. Just as importantly, it’s a chance for the two of you to connect. Nearly a quarter million people have recorded and shared their stories using the StoryCorps App. More than 100,000 stories have been shared under the banner of The Great Thanksgiving Listen, our annual invitation for young people to interview an elder in their family or community. Now in its fourth year, the Great Thanksgiving Listen has grown from an experimental challenge issued by our Founder Dave Isay in 2015 into a vital intergenerational movement. The StoryCorps Archive allows current users to search all interviews recorded during The Great Thanksgiving Listen in order to learn more about our shared humanity. The American Folklife Center at the Library of Congress, our long-term preservation partner, will preserve these amazing interviews and family histories to live beyond our lifetimes and into the future for our great, great, great grandchildren to learn about where they came from through our own voices and first-person accounts. But to access the voices in the StoryCorps Archive, you need a key — a keyword, to be exact! Keywords are descriptive tags that will help current StoryCorps App users and future generations of friends and loved ones, historians, and researchers find interviews and information on the StoryCorps Archive. Keywords are shortened versions of the classic who, what, when, where, and why questions. Adding meaningful keywords will help make your interview accessible for years to come! When you participate in an interview using the StoryCorps App, you will be prompted to enter keywords and a summary when you have finished recording. 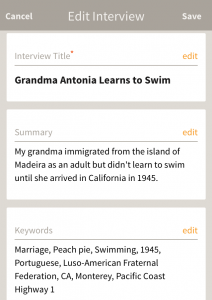 You can edit keywords through the app before you publish your interview, and on the StoryCorps Archive at any time. Both platforms ask you to provide four types of keywords: General, Organizations, Places, and Location. 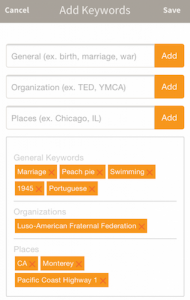 General: Keywords that describe the major themes discussed in the interview (marriage, peach pie, swimming, 1940s), as well as any recording languages other than English (For example, “Portuguese”). Places: Keywords that describe the locations discussed during the interview (For example, “Pacific Coast Highway 1”). To edit your title, summary, or keywords from a desktop computer: log onto your StoryCorps Archive account, go to “View Profile,” and click on the edit icon in the upper right hand corner of the interview. Try to provide between five and 15 total keywords per interview, and don’t forget to include TheGreatListen2018 as a “General” keyword, and your state abbreviation as a “Place” keyword.